Salmon is a highly digestible protein and provides omega-3 unsaturated fatty acids which have a positive impact on mental development, the cardiovascular system, and metabolism (they reduce blood sugar levels). It also helps improve the quality and appearance of coat and skin. Turkey is rich in digestible proteins and has high levels of trace elements such as zinc, and also contains vitamins B3 and B6 which are critical for proper brain function, good muscle tone, and healthy growth. 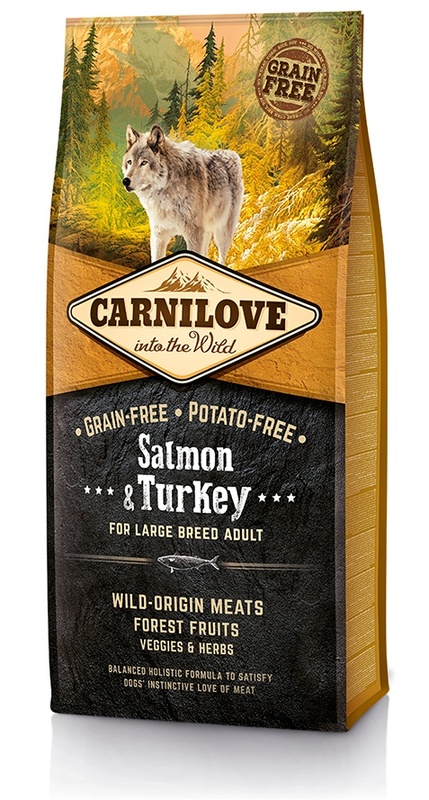 Specially formulated for large and giant breed dogs, Carnilove Large Breed will help keep your big dog in great shape. salmon meal (25%); turkey meal (20%); yellow peas (20%); chicken fat (preserved with tapioca starch; 10%); duck meal (5%); salmon deboned (5%); chicken liver (3%); tapioca (3%); apples (3%); salmon oil (2%); carrots (1%); flaxseed (1%); chickpeas (1%); hydrolyzed crustacean shells (a source of glucosamine; 0;05%); cartilage extract (a source of chondroitin; 0;03%); brewer´s yeast (a source of mannan-oligosaccharides; 0;015%); chicory root (a source of fructo-oligosaccharides; 0;01%); yucca schidigera (0;01%); algae (0;01%); psyllium (0;01%); thyme (0;01%); rosemary (0;01%); oregano (0;01%); cranberries (0;0008%); blueberries (0;0008%); raspberries (0;0008%). Large Breed grain-free dog food. 50% Turkey.